Yes, and no. Chi Omega was active at Cornell from 1917 – 1963, and then again from 1987-2003, when low membership caused it national to shut its doors. 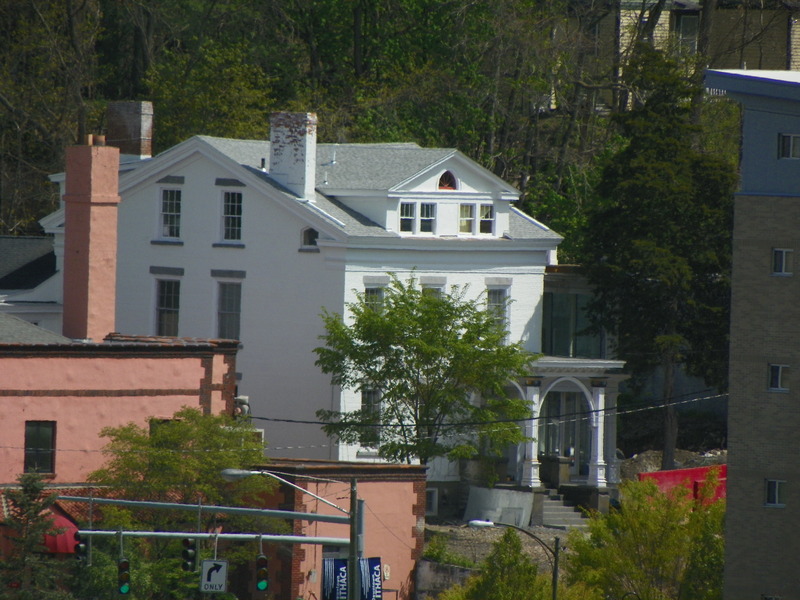 The house at 10 Sisson Place is now occupied by Sigma Alpha Mu. In contrast, Alpha Chi Omega, which was established at Cornell in 1984, it still active on campus. If four years ‘experience is any indicator, they’ve already filled up. A bare-bones student staff of five or six stays on during the summer along with the full time staff, and most of those are current student employees (the year I worked through the summer, we all were). In sum, you can check, but don’t hold your breath. If this is in any reference to the big mixed-use project underway for the boatyard site, then I have good news – they are making progress and gave an update to the city planning board just last night. As soon as those minutes areuploaded, I hope to include them in my next “news tidbits” entry. These entries will be pulled directly from the minutes, since the Ithaca Journal, in a responsible but unfortunate move, now charges for article access beyond a nominal number of articles (renewed each month). 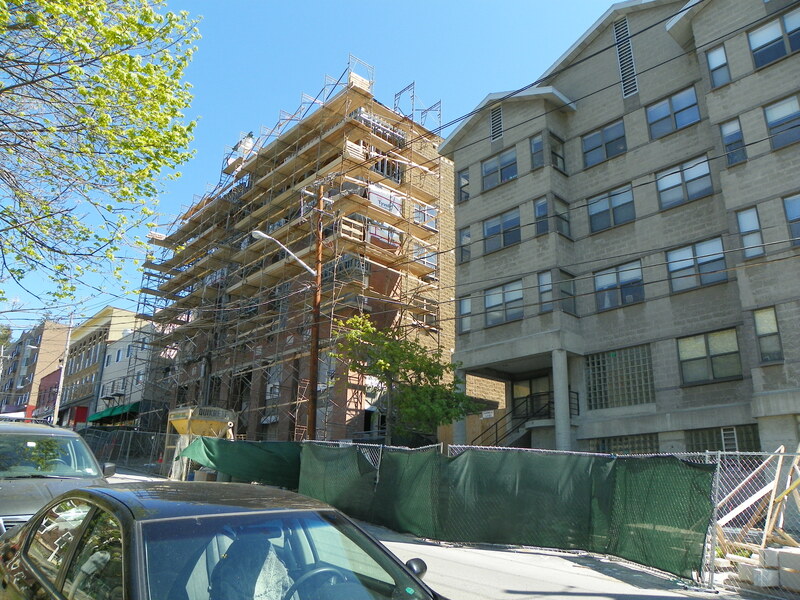 Also on the docket – a redevelopment project for apartments on Thurston Avenue. Going back in time, the Hotel Leonardo was located at 105 N. Aurora Street – at least, back in 1965. The address today pops up a location in front of Sushi O Sake (which is 107 N. Aurora). 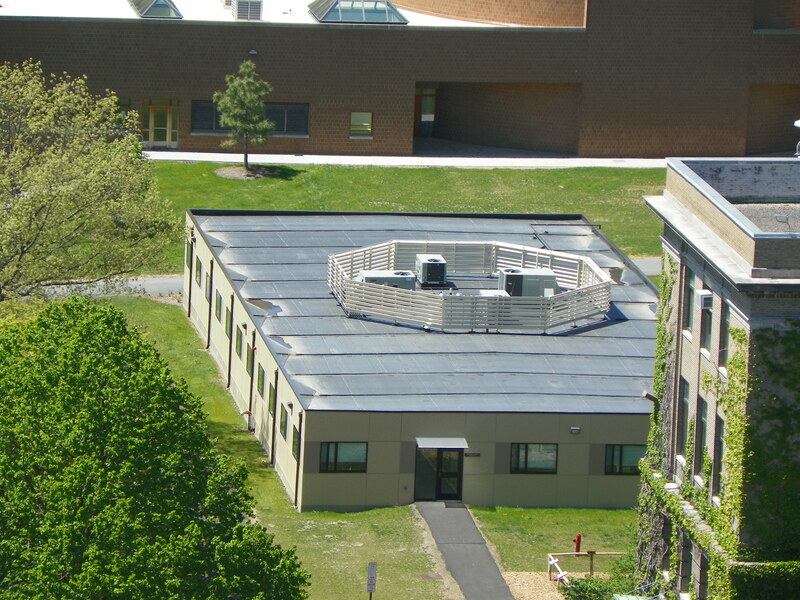 A search indicates that section of Aurora was known as the “Casey Block“, which was built around 1904 (the Wanzer (corner) Block was built the following year), but the stretch was renovated and substantially rebuilt in the 1990s. The Casey Block could be the building that Viva Cantina is now in, or it could have been in the 1990s renovation (the architects refer the original building as “burned out“) that now sits at 107 N. Aurora. I’ll just link to this previous entry, in an effort to limit unnecessary visits to the Ithaca Journal pages. Mid-200,000s expected. Definitely not a place to buy for your child- student. 10 to choose from, four styles. Okay, I maybe dropped the ball on this one. 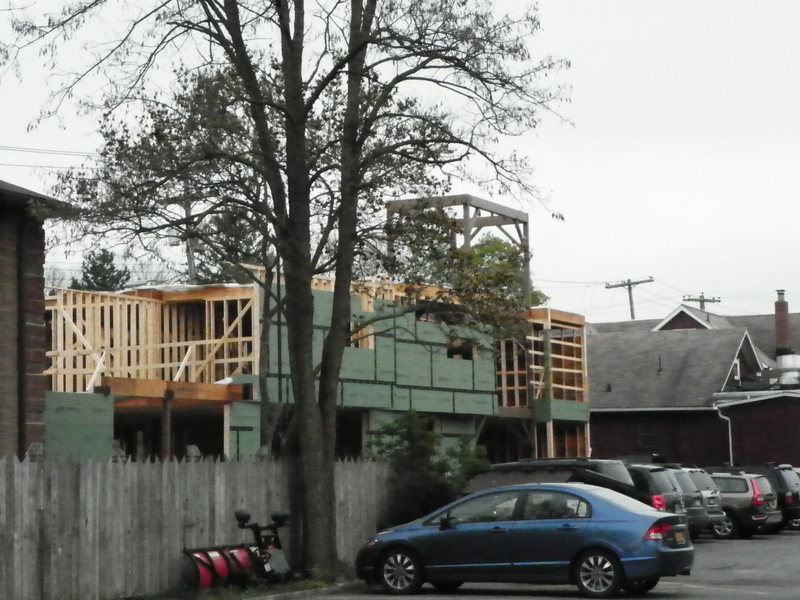 Back in the summer 2010, a 24-unit, 3-story apartment building was proposed for the northwest corner of Seneca and Meadow Streets by Iacovelli Properties. 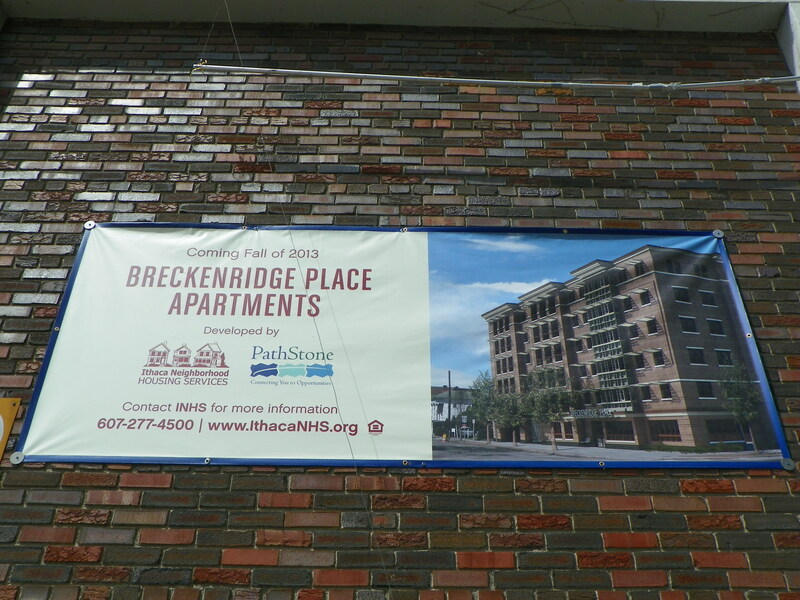 It only recently started construction, and I know there’s a billboard standing on the property, and it shows the design of the new building(s). I know this because I saw it the last time I was in Ithaca I passed the property, but I was driving and did not have my camera in hand (a blessing to all other drivers on the road), I was unable to get a photo. If someone does gets a photo of the project and wants to email that in, I would be delighted. If you want to have a spirited debate on campus, open the floor for a discussion for the provision of guns on university grounds. Stating the obvious here, but student-owned guns are prohibited on campus, and have been for over a century (CUPD officers are issued Glock semi-automatics, an effect of the Willard Straight Hall takeover back in 1969). Few things seem to do a better job of getting someone’s blood to boil, and not without due reason. I thought of looking at this because of this recent little piece from the Sun about a student being robbed at gunpoint in North Campus, and the ensuing “we should be allowed to have guns/are you crazy no we shouldn’t have guns” comment queue. I mulled this over in my head a little while, thinking that this usually gets tied into some “good old days” argument about back when everyone could have guns and everyone was safer (and there was much less crime, everyone was good-looking, all the kids were above-average, and whatever else those rose-tinted glasses show). I decided to look at the Sun archives for some historical perspective. One of the first things returned in the search was an article from 1930 – before the vast majority of us were even alive – detailing a series of armed robberies and the murder of a gas station attendant leading to a possible rise in gun permit applications (the only requirement be that you are a law-abiding citizen of “good character”). So much for those good old days. 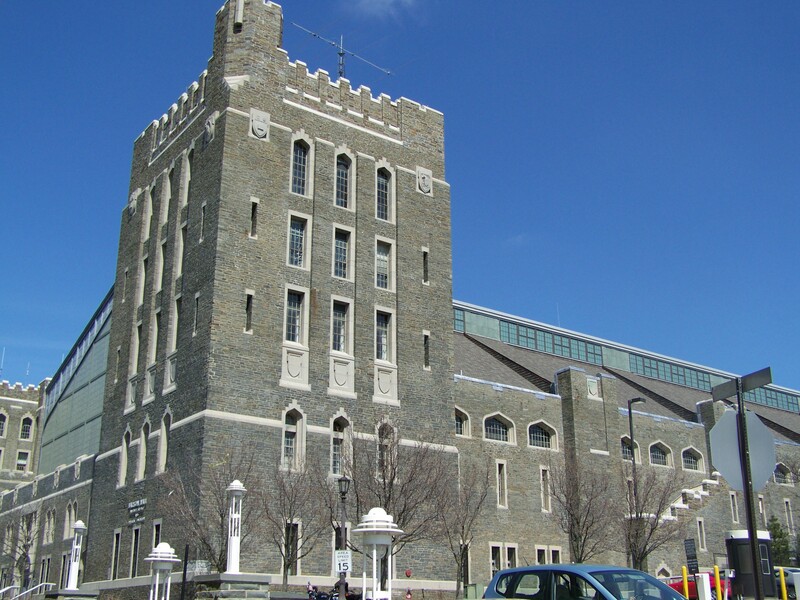 For what it’s worth, the CUPD was formed the following year, with a whopping two patrolmen on horseback, and no guns during day shifts (today, Cornell has six times as many students, and about 45 officers). As for the case of responsible students, it’s not always easy determining which are and which aren’t – as these cases demonstrate. You have (in order) the hard-partying student, the student claiming self-defense, and the self-inflicted fatal gunshot wound (thought to be accidental, but could have been otherwise). In imagining a world where guns were okay on campus, I can see a clear case for pulling the gun rights of the first, a lawsuit waiting to happen with the second (the gun owner claimed he shot at someone who was leaving racist notes under his door), and another lawsuit waiting to happen with the third, if the family gets on the “my child’s university didn’t do enough to prevent this” train. There would be time, money, and a bevy of other issues involved. On the other hand, as this Sun editorial from 1981 illustrates, there are some valuable reasons one can have for owning a gun, such as women protecting themselves against rapists, and it’s important to note that most gun owners are responsible, law-abiding citizens. From here we can get into a range of arguments, all of which are easily blown out of proportion. The passion people put into the guns argument is second perhaps only to abortion, especially with regards to the intransigence of its debaters. So I didn’t write this entry to start up a gun control debate; that’s what news websites are for. The purpose of this entry is to show that there was no “golden era” for either party – no period where guns, or the lack thereof, made us so much safer. There will always be crime, there will always be grey cases in the argument of who is and isn’t irresponsible, and for the foreseeable future, there will be a gun control argument. 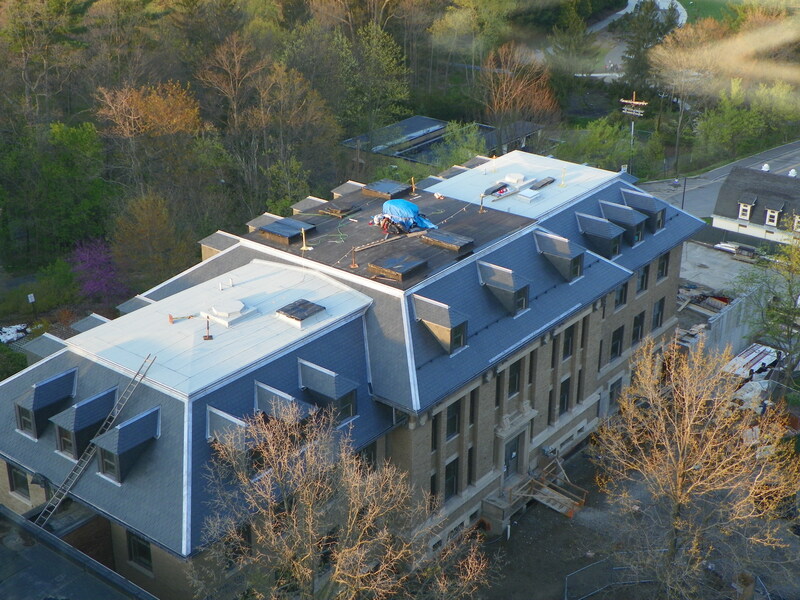 The new Food Sciences Building has completed a substantial amount of exterior work, although the glass facade has yet to be installed. 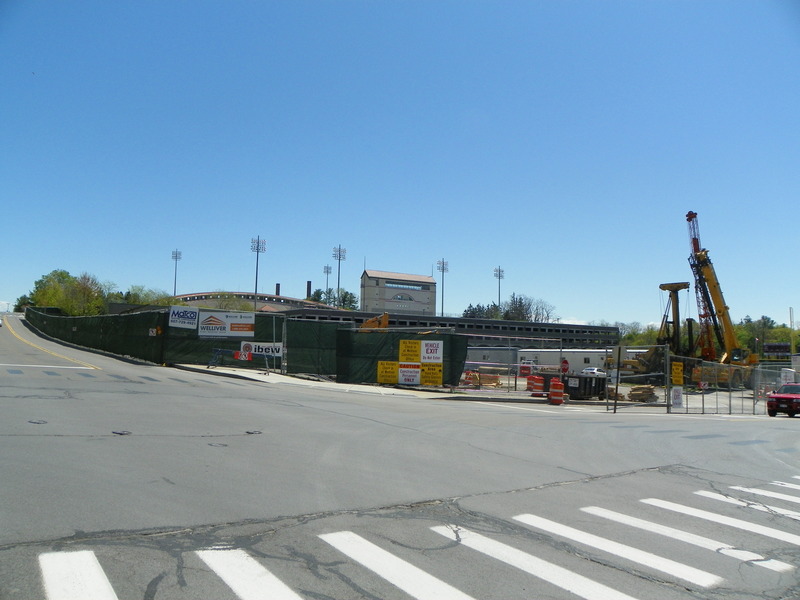 The $105 million renovation is to be completely done in early 2014, with the new Dairy Bar sometime earlier than that. Site prep is underway at Gates Hall (the new Computer Science building). 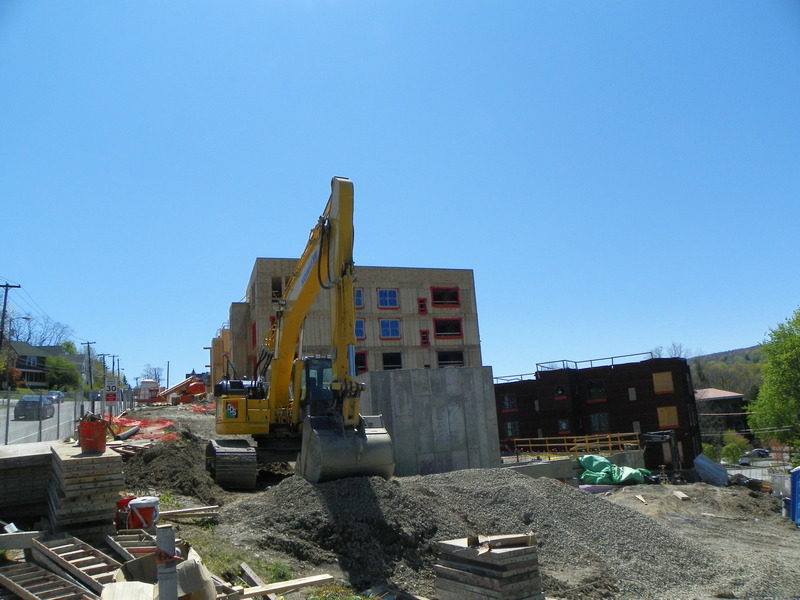 The $60 million, 103,000 sq ft building is targeting a December 2013 completion date. It’ll be a happy day when these plain beige boxes are removed. 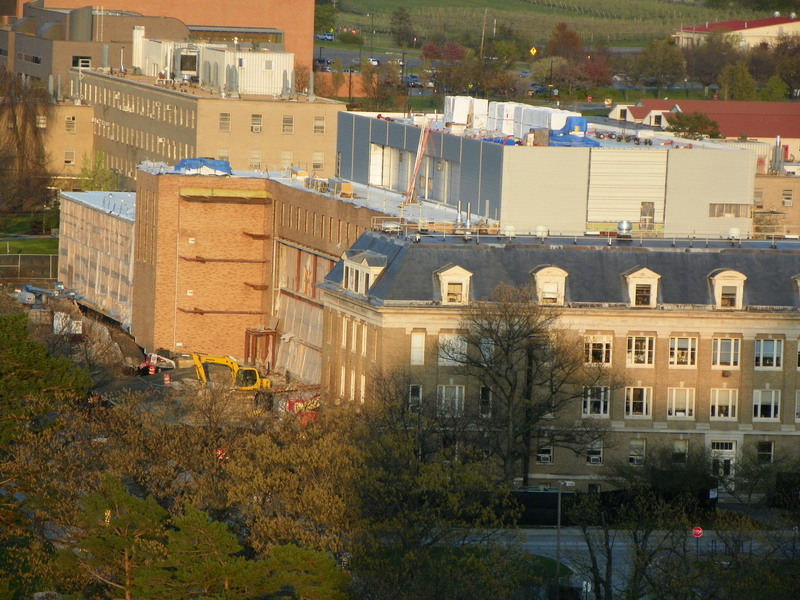 Unfortunately, the $51 million renovation of Warren Hall that necessitated their construction will not be complete until early 2015 (with the Dyson School portion complete by mid-2013 – and it annoys me to refer to the AEM Department as the Dyson School, as if the perceived pedigree was needed to remove themselves from the stigma of CALS). 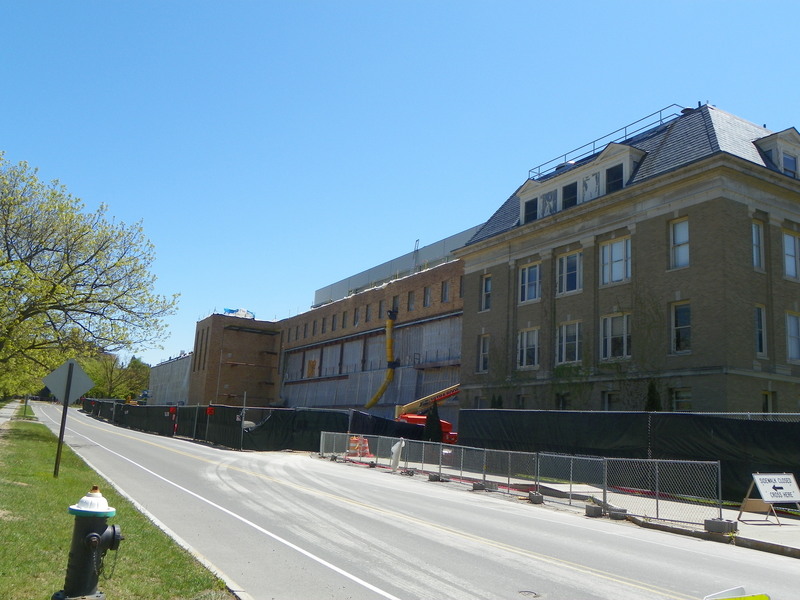 Not the most telling image, but Rice and Fernow Halls are currently in the middle of their renovations. 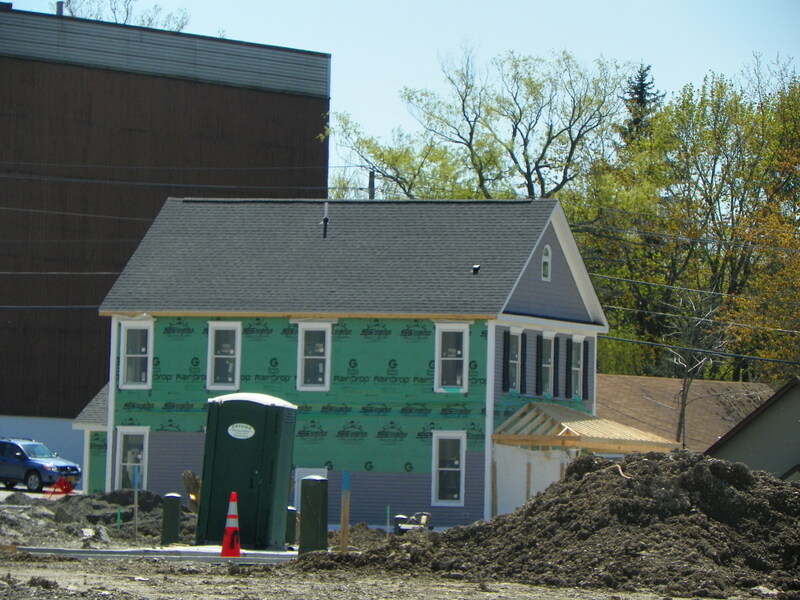 This Bradfield-based photo of Fernow shows the partially-subterranean classroom being built on the east side of the building. I’m disappointed, and I’m not disappointed. I can’t be at Slope Day itself because of a morning meeting (and to seal my fate that day, I’m having new tires put on my car). On the bright side, I did get a chance last weekend to go to a Cornell alumni reception for my major, and the traffic, one could assume, was a lot better than it would be with thousands of young alumni driving back to the area. I took the downtime between alumni events as an opportunity to do some construction photo updating. As nice as it would’ve been to report on some downtown construction, all the sites approved or of buildings “underway” appeared to be dormant from the outside – if they’ve started anything, it might be interior demolition, but there wasn’t any demolition equipment at Seneca Way or Breckinridge Place (which, as I have now discovered, is scheduled for May 15th); the latter had a tarp poster, shown above, but that was about it. 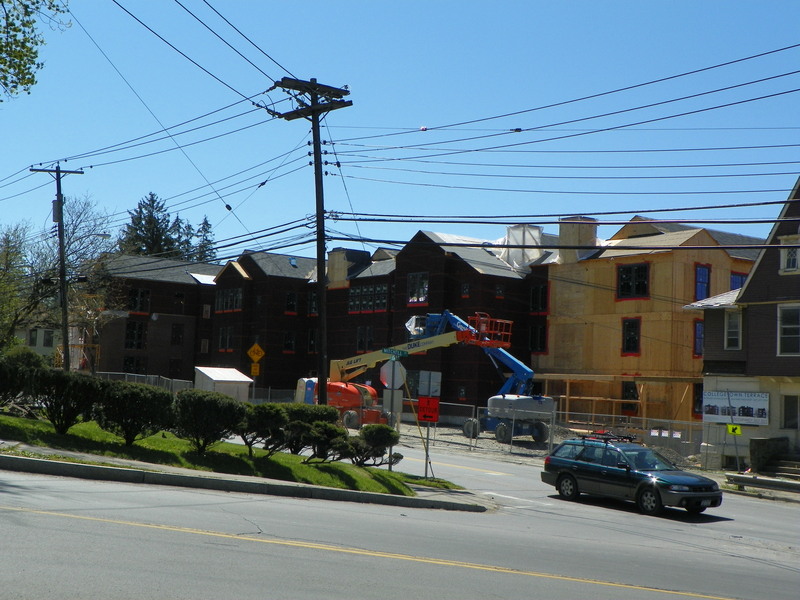 As kinda expected, significant work has yet to start at the Holiday Inn, Hotel Ithaca and Cayuga Green II. That being said, it’s not like there was no progress at all in the area. 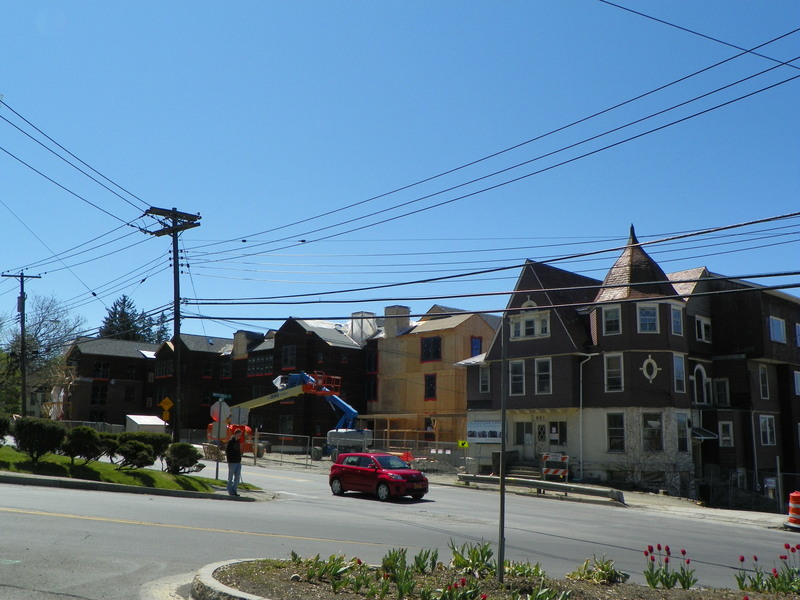 The Argos Inn is nearing completion of its renovation. 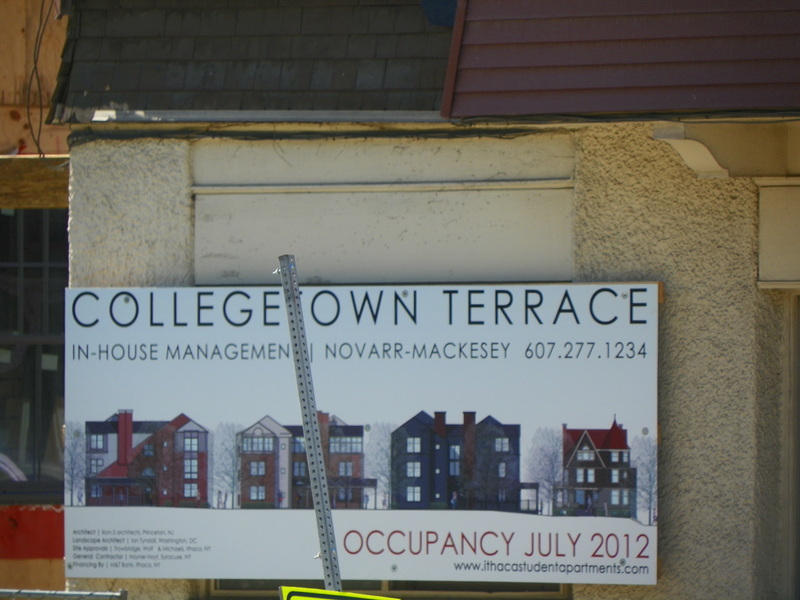 Comparably, construction in Collegetown has been rapid. 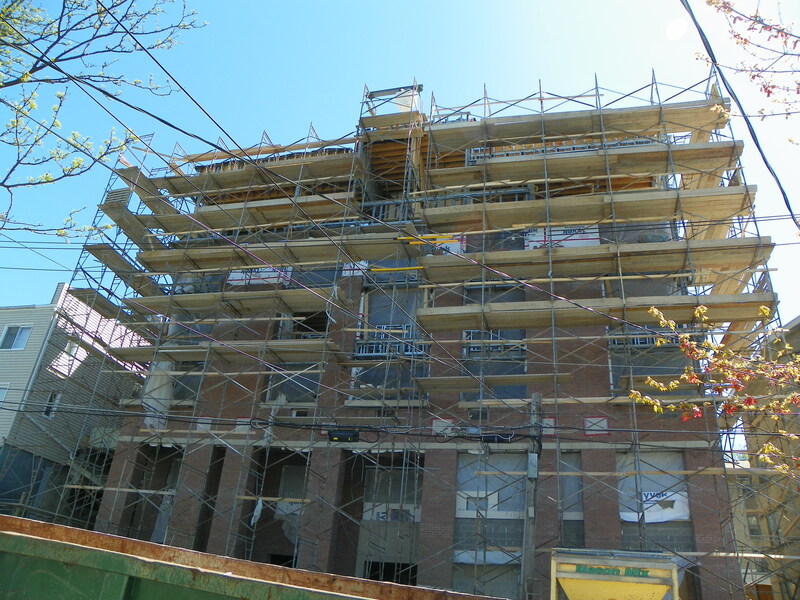 Here, 309 Eddy is undergoing facade installation, and looks on track for an August completion date. 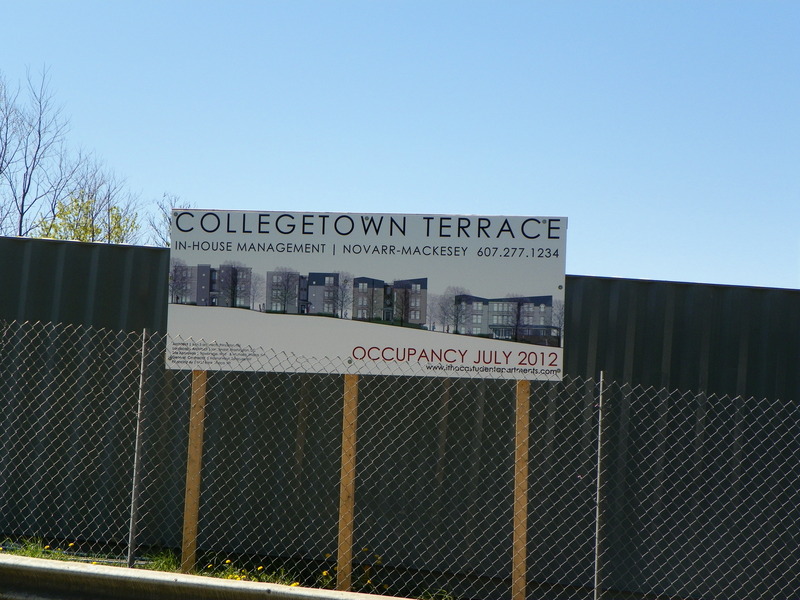 The progress at Collegetown Terrace has been nothing short of astounding. 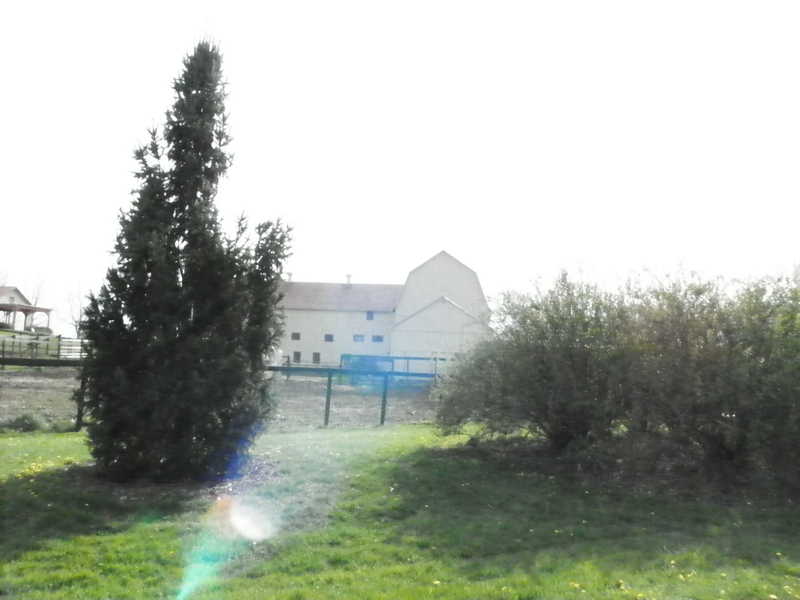 The following photos try to convey a sense of the size and scope of the construction, but I feel they fail to do so. 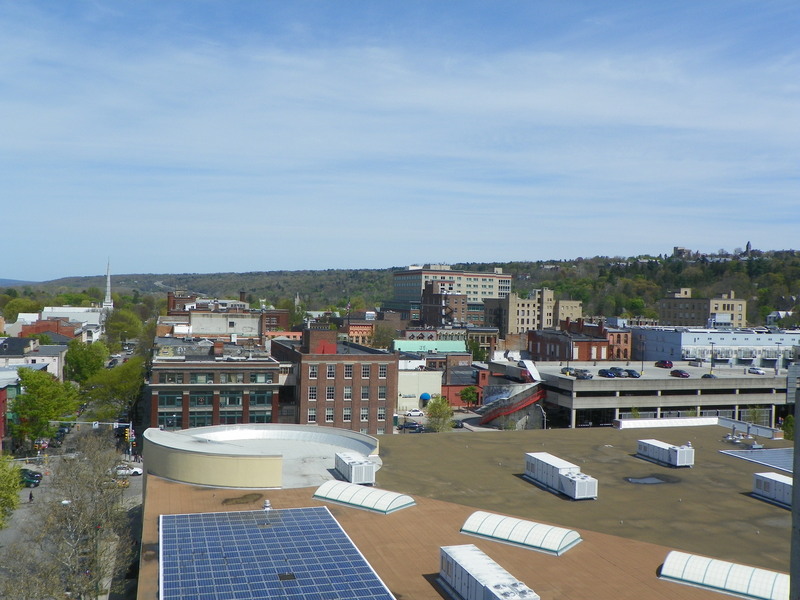 By Ithaca standards, this project is enormous. 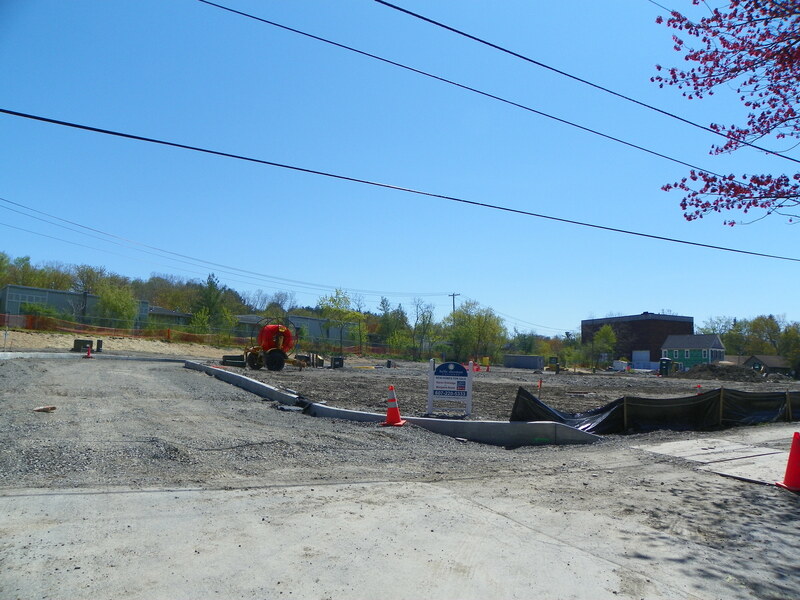 Definitely not a fan of the giant concrete pedestal.Here’s to hoping it gets landscaped into obscurity. 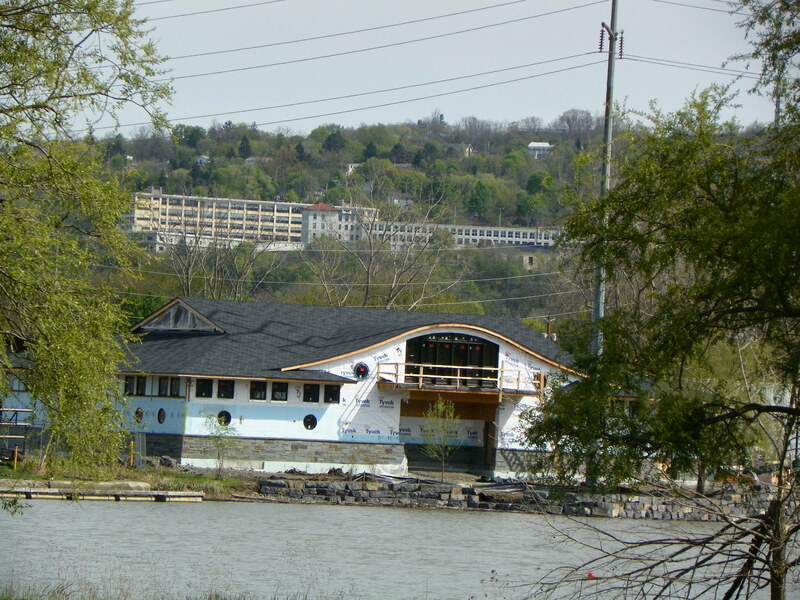 The Ithaca College Boathouse nears completion on Inlet Island. So, this one I only came around by chance, as I was going out with old friends for dinner. Apart from them thinking I’m nuts for taking photo of a building under construction, I’d say this was a pleasant surprise. The building is Magnolia House, a 14-person women’s homeless shelter. 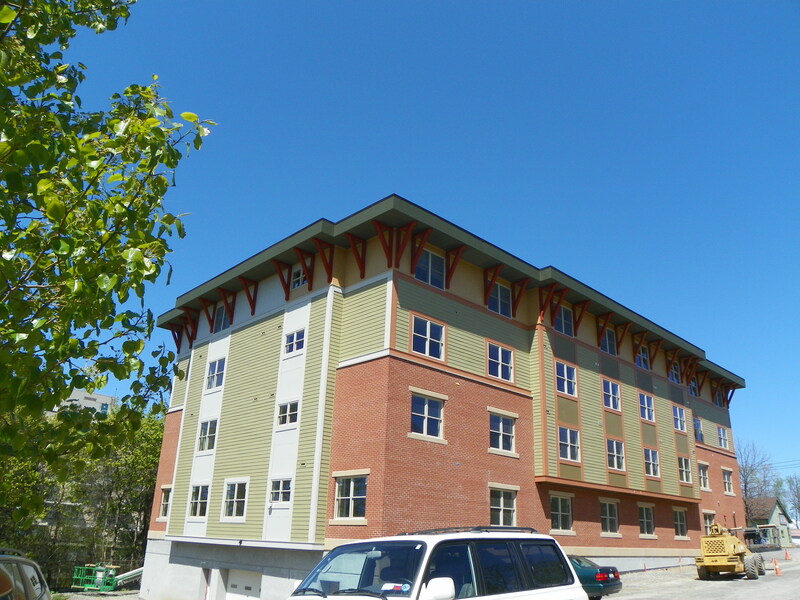 The Coal Yard Apartments Phase II is virtually complete. 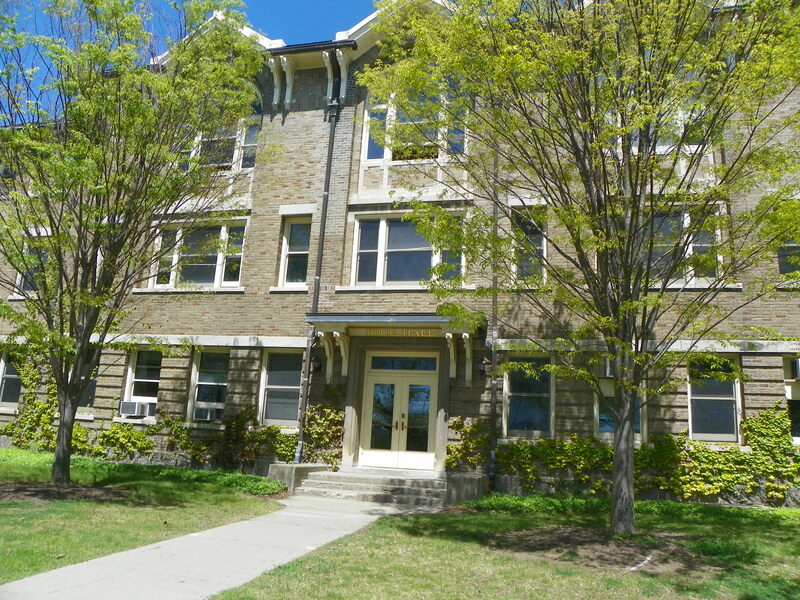 The 4-story building holds 25 apartments. 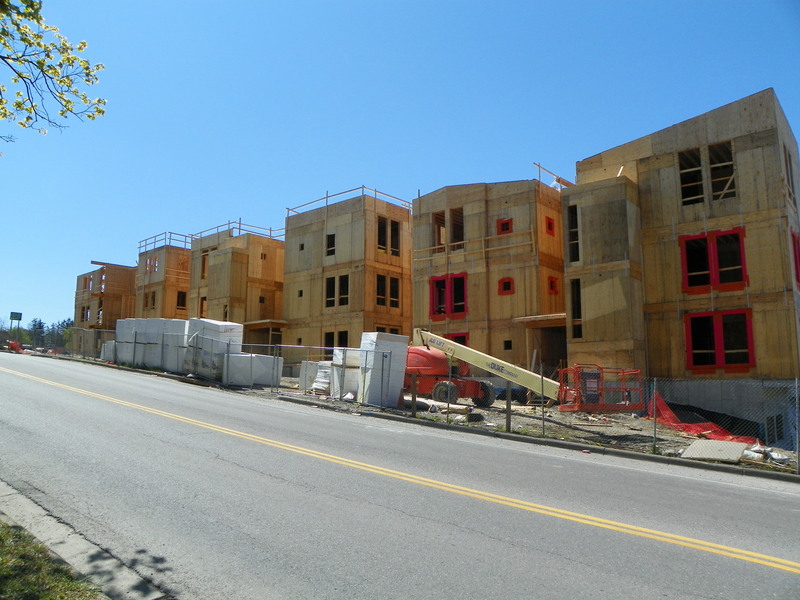 The Vine Street Cottages development continues, with the model unit currently the only building under construction. 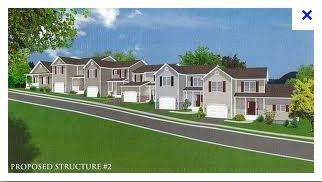 The project includes 19 houses and 10 townhomes. 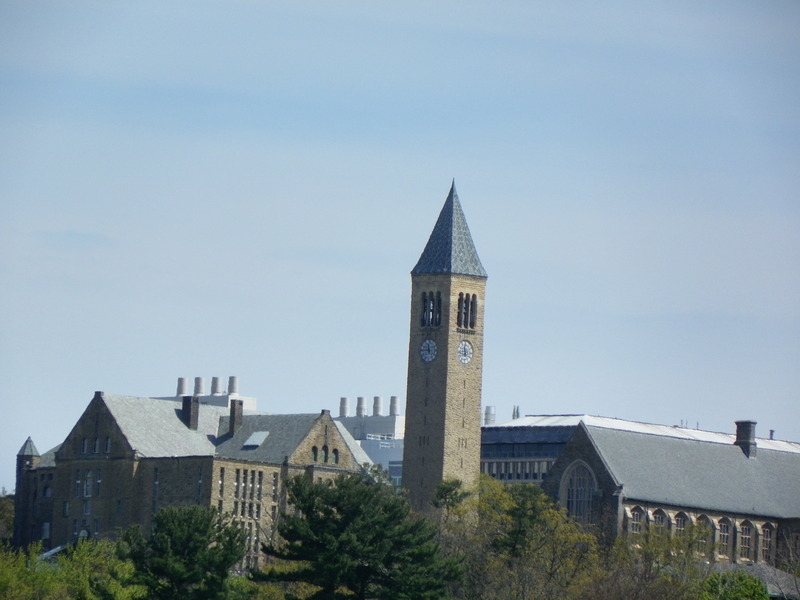 Seeing as my computer is lagging substantially with the uploading of all these photos, I think I’ll cut myself some slack and upload the Cornell project photos in a later entry next week.